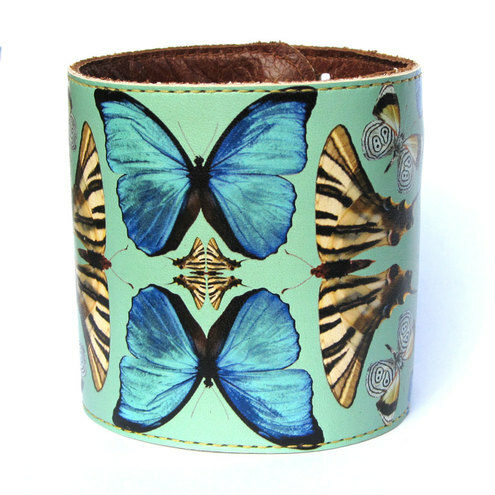 This beautiful cuff with a collage of exotic butterflies looks stunning on. Made of 100% leather with a durable print, this beautiful cuff is hand made to order. The cuff has a secret inner pocket which can hold notes, so can be really useful on nights out, on holiday or any other time. 20.5cm (L) x 6.5cm (W) - this is just over 8" in length and 2.5" wide with two fastenings which will fit wrists that measure 18.5cm (7.3") and 17.5cm (6.9"). ***We are able to adjust the measurements so if you require a different size please get in touch. Folksy :: Buy "Leather cuff / wallet wristband - Birds & Roses"
Folksy :: Buy "Leather cuff/wallet wristband - Koi"
Folksy :: Buy "Leather cuff/ wallet wristband - Chrysanthemum"